Dumping snow at The Resort At Squaw Creek! Lake Tahoe, California is one of my favorite places to vacation in America. 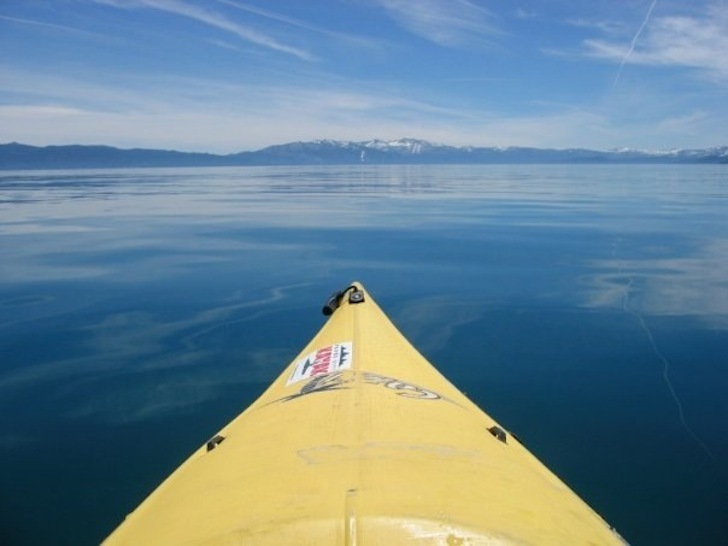 Lake Tahoe is situated roughly 205 miles away from San Francisco and 35 minutes from the Reno, Nevada airport. It’s a place I’ve been going to for amazing skiing/snowboarding during the winter and golfing, hiking, swimming, biking, and fishing during the summer since 2001. 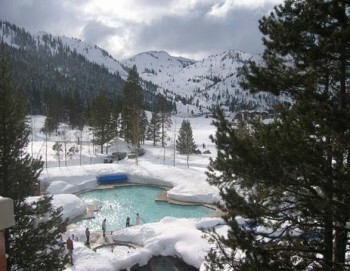 Most people think of Lake Tahoe as a winter destination given the 1960 Winter Olympics were hosted in Squaw Valley USA. Squaw is one of the largest mountains with a 2,850 foot vertical; a top elevation of 9,050; 4,000 acres of skiable area and 270 trails after joining forces with Alpine Meadows in 2012. The mountain is so big that even during peak holiday weekends, there’s hardly ever a wait for the lifts when they are all open. Squaw has seen a record 700 inches of snow for the 2017 season so far. It’s great for beginners and advanced skiers alike. But if you’re a summer lover, summer in Lake Tahoe can be even more beautiful! Every year I spend 4-5 weeks up at my place during the summer and fall for a writing retreat. I love to hike and there are scenic trails all around. I fell in love with The Resort At Squaw Creek when I first moved to San Francisco in 2001. I was 24 years old and just relocated from New York City for a new job in finance. The closest thing New York City has to skiable mountains is the Catskills, which are puny in comparison to the mountains of Lake Tahoe, Colorado, and Utah. When I first began fantasizing about my ideal life I planned to create, I told myself I wanted to live and work in San Francisco and vacation in Lake Tahoe and Hawaii. I made it a goal to save as much money as I could to be able to buy a primary residence in San Francisco first and then seek out a vacation property in Tahoe later. It wasn’t until five years after I bought my primary residence in SF in 2003 that I saved up enough to buy a place in Tahoe at The Resort at Squaw Creek. The Resort sold its initial wave of condos in 2006-2007, and a couple were up for resale. * Two pools, a water slide, and three hot tubs. * A world class restaurant, Six Peaks Grill, where I’ve never had a bad meal. * A deli that’s always open, two more restaurants that are open depending on the season, and plenty of patio seating. * Ski-in/Ski-out access to a blue mountain run called Squaw Creek. The run attaches to the rest of Squaw Mountain through a blue or black run called Red Dog, which goes down to The Village at Squaw Creek. * Valet service for your skis and snowboards. After you’re done, just leave them on the rack and the valet will take away your gear and bring them outside the next morning. * An on-site golf course, where they will also valet and clean your clubs for free. The course is challenging, and you will probably lose some balls because it’s tight. I’d focus on using a 3 wood instead of a driver, unless you are incredibly accurate! * Dog sledding during the winter. * Onsite fly-fishing training pond. * A world-class spa with incredible different types of massages and other body treatments. * Great gym with locker rooms that contain steam and sauna rooms. * Onsite ice skating in the winter. * Mountain bike rentals during the summer. * Tennis, outdoor chess/checkers and lawn games in the summer. I’ve vacationed everywhere around America and the world, and I definitely pick Lake Tahoe as one of the 10 best places to relax any time of the year. Squaw Valley is just three miles away from the lake where you can kayak, rent jet skis, go parasailing, or swimming. It’s awesome to eat lunch on a sun-soaked deck overlooking the lake afterward. If you want to try your luck on the tables, you can drive 35 minutes to Reno or 10-15 minutes to the California / Nevada border right off Lake Tahoe’s west side. It’s much more adult-like and peaceful in the North and Western Lake Tahoe region. If you’d like more clubs, gambling, and rowdy times, South Lake Tahoe is the place for you. Want to check out The Resort At Squaw Creek and see for yourself why it’s such a magical place to vacation? You can rent my luxury condo! For all you bargain hunters, the best deals and the quietest times are in April, May, September, October, early November (Resort shuts down for cleaning second half), and the first half of December before the holidays start. The best times for winter skiing/snowboarding are December, January, February, March, and April, often through spring break. Prices tend to be more expensive during peak holidays, but my unit is 25% cheaper than other units on average. You can book via the links below. The best times for warmer weather are end of May, June, July, August, September, and October. Here are the details of my Lake Tahoe vacation rental for those interested. * One king size bed, two queen size beds, and a pull out bed that occupies 1,025 square feet of space. * Wifi included in the Resort Fee which goes to the Resort and not me. My 2/2 condo can be rented in three different, private configurations. Click the links to check availability, make a reservation and bookmark! 1) A one bedroom suite with a living room (two rooms), king size bed, pull out queen bed, dining room, kitchenette (microwave, dishwasher, dishes, silverware, two electric cooktops, refrigerator, coffeemaker). Can comfortably sleep 4. 2) A studio with two queen beds, desk, and full bathroom. This is a stand-alone unit separated by a double door lockout. Can comfortably sleep 2-4. 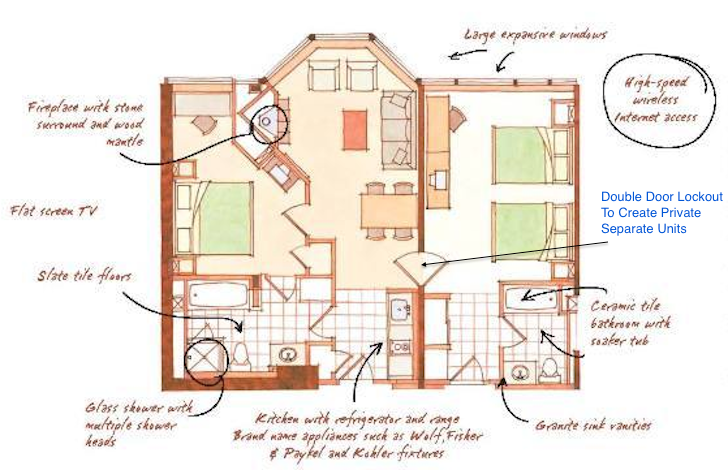 3) The entire two bedroom, two bathroom which offers around 1,020 square feet and sleeps up to 8 comfortably. You get the entire unit you see in the picture. Rent the entire two bedroom, reserve the left hand side private one bedroom suite, or the right hand side studio. Using the links above, select check-in and check-out dates on the calendar and then click “Book Now.” You don’t actually book anything yet after you press the button. The page just shows the total cost, including The Resort fee the Resort gets, and the one time cleaning fee upon departure. One thing to note is that The Resort charges an exorbitant $250 cleaning fee per session for a 2/2, and $200 for a studio or 1 bedroom. Hence, do not ask for cleaning intra-stay. Please check the cancellation policy too. Here are the links again to book! Please BOOKMARK this page if you plan to vacation in Lake Tahoe in the future. I’m going to keep my Resort At Squaw Creek properties forever so check back for availability anytime you want to head to the mountains. Even if you don’t rent my place, I hope you’ll have a chance to one day vacation in Lake Tahoe yourself. 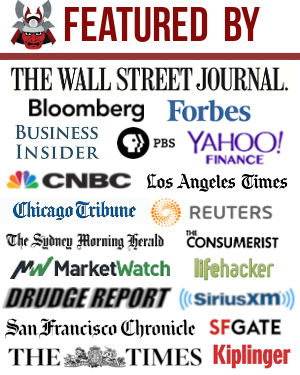 About Financial Samurai: Financial Samurai started in 2009 and is one of the largest, most reputable personal finance websites in the world with over 1 million organic pageviews a month. The site helps you achieve financial independence sooner, rather than later and is the most trusted personal finance site on the web. 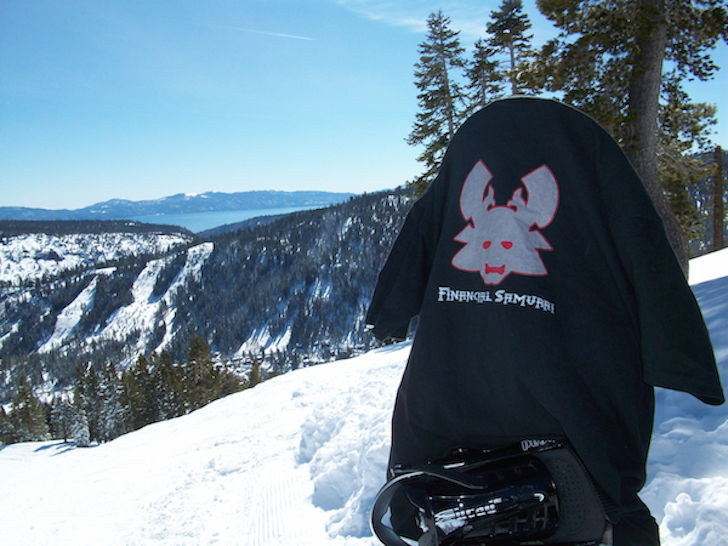 Sam moved to San Francisco in 2001, got his MBA from Berkeley in 2006, and has owned his Lake Tahoe property since 2007. He’s an avid skier and snowboarding and goes up to Lake Tahoe at least 10 times a year!